(Pictures from the phone since I forgot my camera!) I was very excited when I heard that we were going to a steakhouse for dinner. Texas = steak. It sounds like a MUST. 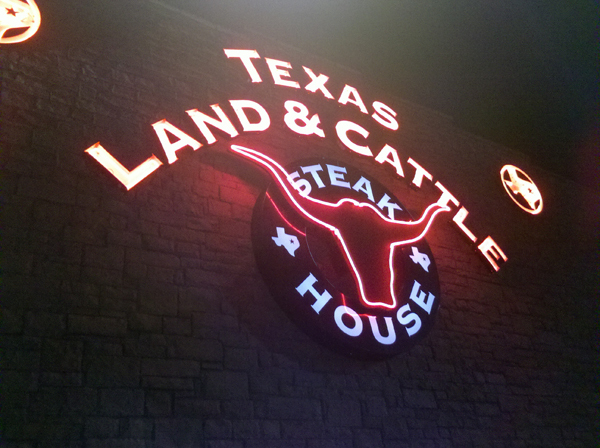 I heard from my cousin that the prices were pretty good for a steakhouse and that the food was great there. How could I resist Texas beef? Luckily there was a deal for two entrees and an appetizer for $25 so my brother and I snagged that one to save on money. 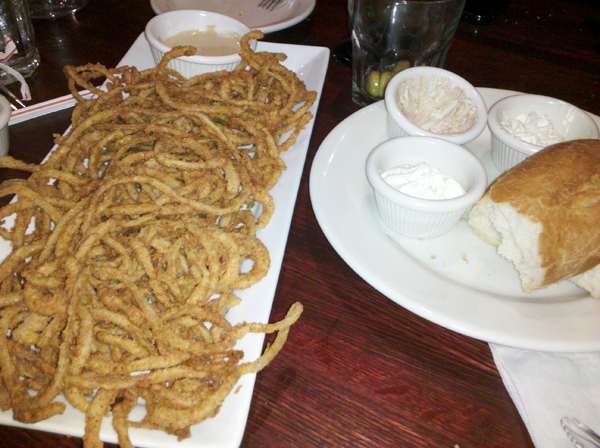 Our appetizer of choice was the plate of onion strings. There were a LOT of onion strings, and they were well-crisped. I don't like it when onion strings or onion rings are heavily battered but these weren't. To start, the tables also got delicious bread with butter and cinnamon butter to dip. Great stuff. Entrees come with soup or salad and a side of choice. 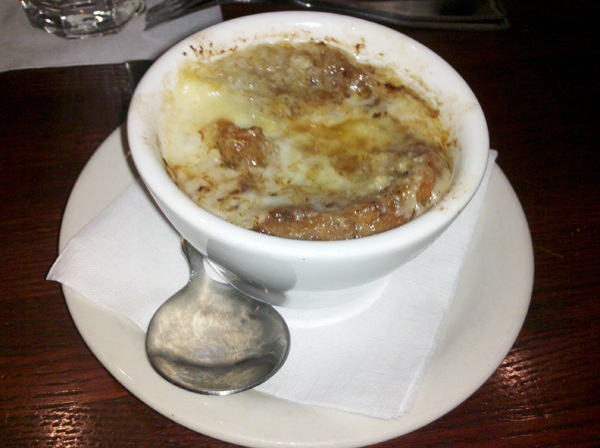 My soup came out first, and it was a cup of French onion soup. Yes, I had onions right after onions. It was actually very good. Usually French onion soups that I have are very salty but this one was a good mix of saltiness and savoriness. The cheese on top was still hot and melty, and the bread underneath was a nice combination of crunch and soft. That was awesome since the bread pieces are usually soggy whenever I get French onion soup at other places; it was a definite sign that they had made it shortly before serving it. Then my medium rare 8 oz. 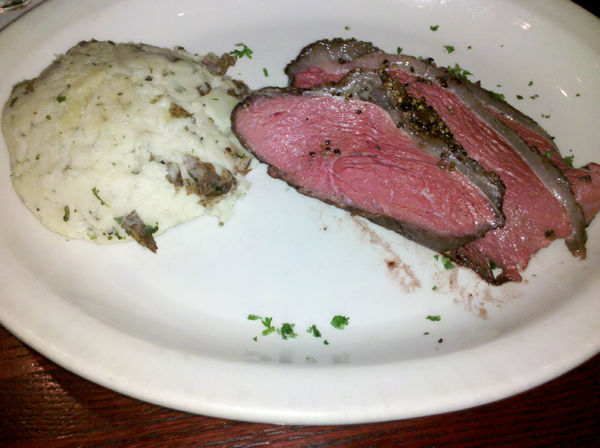 smoked sirloin came out with garlic mashed potatoes. Oh my. It was cooked to the right temperature, and the smokiness of the beef was delicious. The beef was tender and oh so flavorful. I loved the pepper-crusted edges too. Though it looked small on the plate, its richness (and all the other food) had me nearly bursting. I can't remember the last time I had such a delectable steak. Fantastic place. I wish I could go again!